The 7th Ave N Access located just south of the Kennedy Bridge can best be reached by proceeding northward from the downtown area along N 3rd St (caution, one way!). Look for the parking lot on your right across from 7th Ave N (see on Map). An opening in the flood wall allows hikers and bikers to pass through. The multi-use trail to the right proceeds through the downtown area, past the Sorlie Bridge, to the Point Bridge. The multi-use trail can also be accessed in the downtown area by walking to the foot of the Sorlie Bridge where the trail goes north to the Kennedy Bridge and south to the Point Bridge. This stretch of the Greenway is a very pleasant place to spend some time, although the bird diversity is rather low. Mature cottonwoods occur along the river from the Kennedy Bridge (US Highway 2) to the downtown area, but the understory was cleared several years ago. A more lawn-like area opens up as you go South past the downtown area and on to the Point Bridge. As a result, the habitat is not as diverse as in Riverside Park. Watch the sky for aerial species such Chimney Swifts, swallows, and Common Nighthawk. The latter species may now be seen only as a migrant. 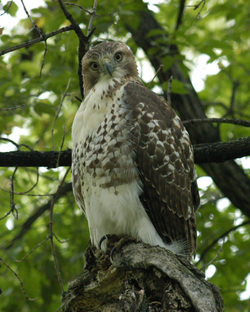 The area around Kennedy Bridge is a good place to spot a hawk or an eagle. The open skies make it easier to see raptors migrating in the fall or spring. Spotted Sandpiper may be seen at waters edge and Red-headed Woodpeckers sometimes nest in dead cottonwoods.